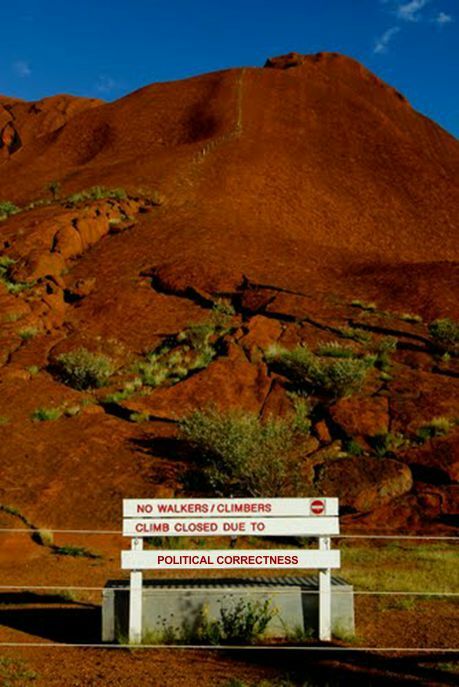 Trying to get positive changes at the ABC appears to be a lost cause but we may still be able to stop political correctness, myth and superstition, and petty bureaucracy from making the world a worse place and save that iconic natural experience at the heart of the continent. With that in mind posting here will be infrequent. Make sure to follow us at the Right to Climb Blog. Research science used to inform public policy decisions, herein defined as “Policy-Science”, is rarely subjected to rigorous checking, testing and replication. Studies of biomedical and other sciences indicate that a considerable fraction of published peer-reviewed scientific literature, perhaps half, has significant flaws. To demonstrate the potential failings of the present approaches to scientific Quality Control (QC), we describe examples of science associated with perceived threats to the Great Barrier Reef (GBR), Australia. There appears a serious risk of efforts to improve the health of the GBR being directed inefficiently and/or away from the more serious threats. We suggest the need for a new organisation to undertake quality reviews and audits of important scientific results that underpin government spending decisions on the environment. Logically, such a body could also examine policy science in other key areas where governments rely heavily upon scientific results, such as education, health and criminology. The impact of changes in solar activity on Earth’s climate was up to seven times greater than climate models suggested according to new research published today in Nature Communications. Researchers have claimed a breakthrough in understanding how cosmic rays from supernovas react with the sun to form clouds, which impact the climate on Earth. The findings have been described as the “missing link” to help resolve a decades long controversy that has big implications for climate science. 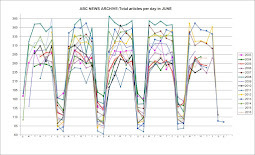 Lead author, Henrik Svensmark, from The Technical University of Denmark has long held that climate models had greatly underestimated the impact of solar activity. He says the new research identified the feedback mechanism through which the sun’s impact on climate was varied. Read the rest at the link above, or at videnskab.dk you won't read this on "our" ABC. Ions produced by cosmic rays have been thought to influence aerosols and clouds. In this study, the effect of ionization on the growth of aerosols into cloud condensation nuclei is investigated theoretically and experimentally. We show that the mass-flux of small ions can constitute an important addition to the growth caused by condensation of neutral molecules. Under present atmospheric conditions the growth rate from ions can constitute several percent of the neutral growth rate. We performed experimental studies which quantify the effect of ions on the growth of aerosols between nucleation and sizes >20 nm and find good agreement with theory. Ion-induced condensation should be of importance not just in Earth’s present day atmosphere for the growth of aerosols into cloud condensation nuclei under pristine marine conditions, but also under elevated atmospheric ionization caused by increased supernova activity. ABC alarm: OMG Coffee will be gone!!!! ABC post this alarmist piece from activist Molly Harriss Olson, CEO of Fairtrade Australia and New Zealand. The countless cups of coffee downed during the UN's COP23 climate summit in Bonn may seem insignificant.But if coffee consumption has any message, it is that climate change is personal. Worldwide, more than 2.75 billion cups of coffee are consumed every day. Half of all Australians love a good coffee to kick-start each morning. 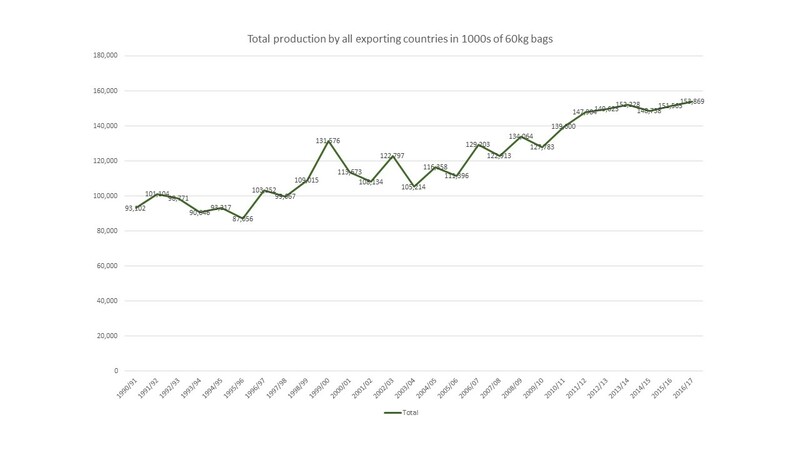 Yet, as climate change influences weather patterns around the world, coffee yields and quality are already suffering, and pests and diseases are on the rise. "Already suffering". 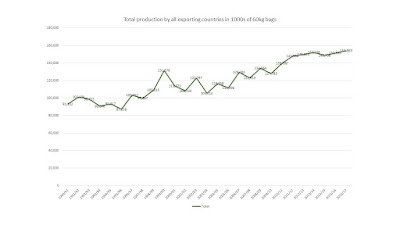 Simple Fact check using production figures from the International Coffee Organisation shows production figures over the last few decades have improved significantly, during a time of rising temperatures. Testing my morning brew reveals a good tasting cup of joe. ABC cover the idiot Greens extension of a ban on GM crops in SA. The report lacks any inquiry into the long term consequences for SA. Looks like they'll be starving in the dark. 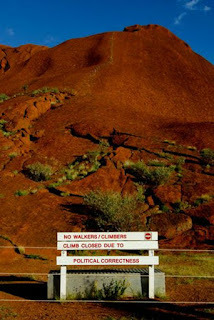 The Uluru (Ayers Rock) climb was closed for parts 229 days of the 273 days between January 1 and September 30 this year. That’s 84% of the days. The reasons for the closures include wind, rain, storms or extreme temperatures, according to Parks Australia, the Federal instrumentality that manages the park. The climb is opened again when rangers deem it safe. In January and February the climb was closed from 8am every day “due to heat” and longer on 52 of the 59 days in those two months. A Parks spokeswoman says the climb is closed “for people’s safety” for the following reasons: If the temperature reaches 36 degrees or above; there is a greater than 20% chance of rain within three hours; there is a greater than 5% chance of thunderstorms within three hours; the estimated wind speed at the summit reaches 25 knots or above; more than 20% of the rock’s surface is wet after rain; cloud descends below the summit or for cultural reasons, for example, during a period of mourning. During the height of the tourist season the climb was closed at some time during the following number of days: May – 20 days, June – 26, July – 10, August – 29. The climb is now always closed at night, from about 5pm to 7am. "It is a truth universally acknowledged, that a media outlet fighting for readers must be in want of a clickable headline quote." Could not have described ABC News more succinctly. Its mediocrity is palpable.